As many as 81 horses remain in the frame for the Randox Health Grand National in under three weeks time, with some noticeable absentees including Elegant Escape. Trained by Colin Tizzard, son Joe - assistant to his father said that the Welsh Grand National winner had not come out of his exploits in the Gold Cup last Friday in a healthy enough manner to make the trip to Aintree. The 7yo finished sixth, twenty-six lengths behind the winner Al Boum Photo, who broke Willie Mullins' long unwanted record of failing to land the Festival feature before. After the race, the big boss Colin called the performance by Elegant Escape a "massive trial" for the Grand National, but a twenty-two day split between the races has not proven wide enough for him to recover adequately. (Credit: Racing Post) Explaining the reasons behind his absence, Joe Tizzard said: "He's perfectly fine, he just had a hard race when sixth in the Gold Cup and with only a three-week gap we thought it best to leave him out. "He's only a seven-year-old and has had a reasonably hard campaign but could still run again this season." Other names missing are The Last Samurai and American which will come as no surprise as the Harry Fry duo have both been retired - the former a previous National runner-up. The shock withdrawals certainly came from the Gary Moore-trained Traffic Fluide, who had been primed for this race since winning the Grade Three Sodexo Gold Cup in splendid style at Ascot before Christmas. Black Corton, Royal Vacation, Give Me A Copper and Total Recall represent the best of the other sixteen exclusions. 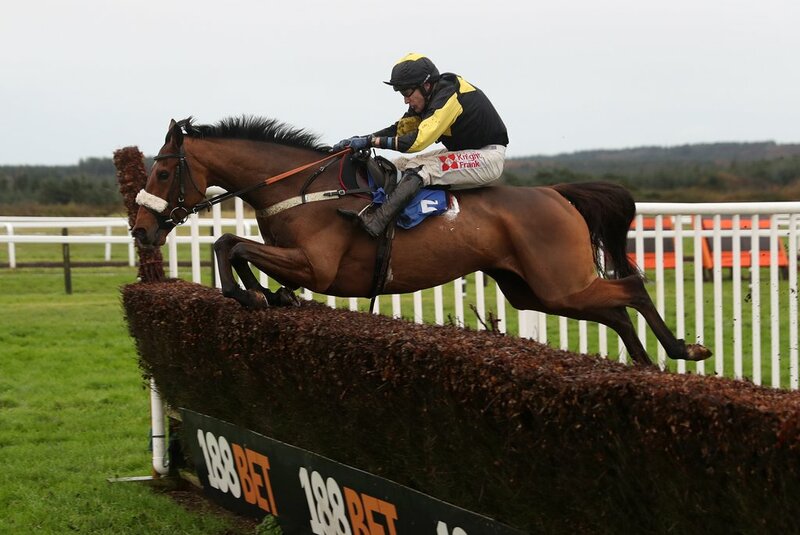 But with 81 still engaged, and only 40 guaranteed to run, Elegant Escape's stablemate Ultragold will hope to make the frame, despite pulling up in the cross-country chase at the festival last week. (Credit: Racing Post) Tizzard said: "We could still run Ultragold [10st 3lb], who won the last two Tophams and is entered for both races. "We'll look at the entries and decide which race to go for." Gordon Elliott set aside any doubts that Tiger Roll will not be heading to Aintree in three weeks times on Monday afternoon, by confirming that his stable star has come home fit and well from his Cheltenham exploits, and is ready to roar in the National once again. The 9yo - who stormed to a second near twenty-five length success in the Glenfarcas Chase at Prestbury Park last week will bid to become the first horse to win back-to-back Grand Nationals since the great Red Rum did so back in the 70's. After his fourth victory at the Festival, his owner Michael O'Leary had disclosed his own uncertainty about his star's participation on Merseyside. However, the trainer's word has come to the fore, where Elliott conceded that the English Grand National on April 6 was very much the number one plan. (Credit: Racing Post) Elliott said: “He’s a horse of a lifetime. He's come out of Cheltenham very well and the plan is to go for the Aintree National. "Obviously I'll have to discuss it with Eddie and Michael [O'Leary] but he's come out of Cheltenham very well so I can't see any reason why he won't be running there next. “I spoke to the English handicapper yesterday and he said he put him up 8lb for winning the cross-country, and he might have been easy on him giving him that, as he could have put him up 10lb or more. “That'd only leave him 1lb wrong on last year and it looks like he's a different horse this year than he was last year," Elliott finished. Bristol De Mai hushed some of his anti-Haydock critics, by finishing third to Al Boum Photo in the Gold Cup, but will need to contend with top weight of 11st 10lb. The runner-up Anibale Fly has been awarded four pound less [11st 6lb], and will look to enhance his good fourth place finish in this contest twelve months ago. Three-time winning owner Trevor Hemmings has two leading fancies in Vintage Clouds and Lake View Lad, the Ultima Handicap Chase second and third who have been assigned 10st and 10st 11lb respectively, and surely look well-in if they make the cut. Hemmings, who has won the race three times with Hedgehunter , Ballabriggs  and most recently Many Clouds , will be bidding to become the most successful owner in Grand National history. The Grand National now under three weeks away, and Tiger Roll is shortening all the time..